Vikki Bird Designs: The Marathon sock KAL! 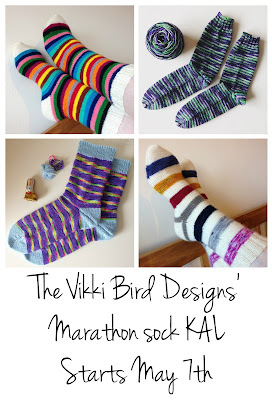 I quickly realised that knitting a Marathon's-worth of socks was going to take rather a long time. But what about if I had help? 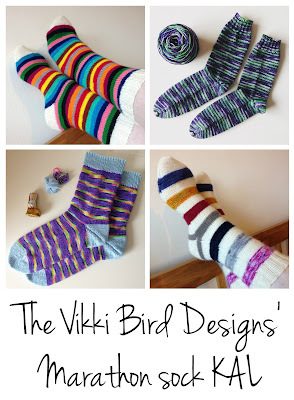 Which gave me the idea for a new knitalong: the Sock Marathon KAL. The KAL will be running from May 7th in my Ravelry group, and will continue until a full Marathon's-worth of socks have been knitted! There are a few rules, which I've listed below, but anyone is welcome to join in – the more the merrier! To join the KAL, head over to the chatter thread in my Ravelry group,** introduce yourself, and tell me what you're planning on knitting. How long do you think the KAL will take? Do you think we'll be done by the 2019 London Marathon? Knit a Marathon's worth of socks: 26.219 miles of sock yarn converted into socks. **You'll need to be a member of Ravelry to join in the KAL. Membership is free.